First things first, native Australian bees or European Honey Bees? Well, both – but for slightly different reasons. We often hear about the serious threat to worldwide Honey Bee populations, but have you ever thought about our very own native bees? You may be surprised to learn that Australia actually has over 1600 identified species of native bees which don’t build hives or produce honey. However, they play a role just as important as our foreign friends. Not only are native Australian bees effective pollinators of several fruit, vegetables and nut crops, but they are also critical for our biodiversity and the pollination of our wildflowers and native plants – many which can’t be pollinated by introduced bee species. On the other hand, European Honey Bees were introduced into Australia approximately 200 years ago and since then, they have become a vital species to the Australian environment .Although the European Honey Bee may out compete native fauna such as birds, for food, habitat and resources, the Australian agricultural industry replies heavily upon their crop pollination and the production of honey and associated bee products. Honey Bees have become so imbedded into our ecosystem and we rely so heavily on them for pollination, that it would make no sense to disrupt the balance and remove them from the environment. Both native and introduced species are crucial for our food security and natural landscape. However, due to natural habitat destruction, urban expansion, climate change, intensive farming practices, pesticide toxicity and the spread of diseases, bee populations around the world are dramatically declining. But not to worry, we’ve put together a few ways you can help save and support them from the comfort of your own home. One of the most beneficial and easiest ways to attract bees is to include bee-friendly herbs in your garden. Dill, mint, lavender, rosemary, basil and thyme are all popular amongst pollinators, and lucky for us, they’re also super easy to grow. Harmful pesticides and toxic herbicides, which are often found in commercial gardening products, not only kill off pests, but also impact the physical ability of bees to fly and forage for food, shorter their life expectancy and interfere with communication. Instead, why not hand weed or make your own vinegar garden spray. When you buy local raw honey, not only are you saving the bees, but you’re also supporting local businesses and beekeepers. Commercial honey, found on the shelves of Woolworths and Coles, has often undergone several production steps including pasteurization and filtration, as well as the removal of beneficial nutrients and added sugar, to reduce costs, meet consumer standards and extend shelf life. There has also been concerns with imported honey, begin passed off as Australian honey, containing harmful antibiotics. 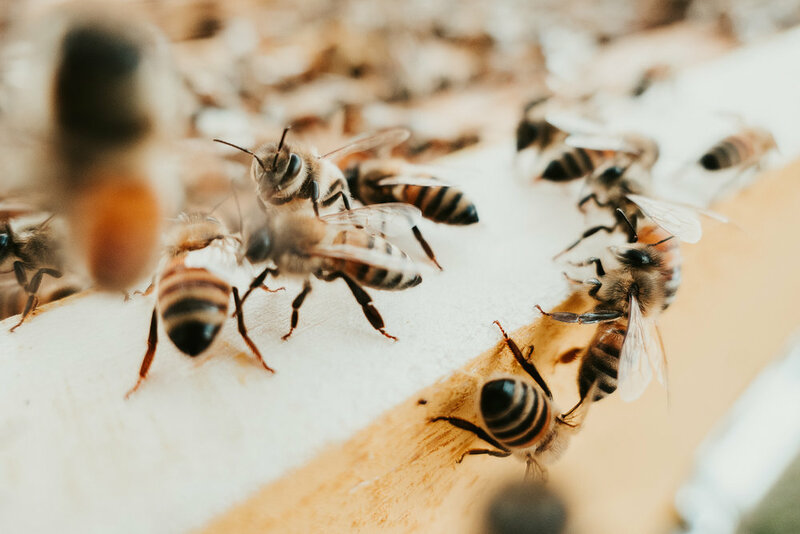 Honeybees are often treated with antibiotics during farming stages to clear out gut bacteria, but it has been found that bees treated with these antibiotics are half as likely to survive the week after treatment, compared with untreated bees. But just remember, raw honey is not the same as organic honey, as they are subject to different regulations. Organic honey must simply come from a farm that meets organic stands in Australia and means the bees, farm, flowers and honey are not allowed to come into contact with pesticides, chemicals or any other factors that does not meet the Australian Organic Certification Standard. Although it may be difficult to find, search for a raw and organic bee farm or honey supplier near you. It’s that word again – Organic. And trust me, I am aware organic produce and products are usually double the price and wrapped in unnecessary plastic packaging. I also know it’s not always realist or practical to be doing your weekly shop at the farmers market, early on a Sunday morning. So, sometimes we have to take a sneaky trip to the supermarket and there’s absolutely nothing wrong with that. But one of the easiest conscious swaps I’ve made when shopping at Woolies or Coles, is buying organic tinned beans and legumes. They’re not much more expensive than the regular cans (I’m talking 50 cents) and I’m willing to pay that little bit more to know that the food I buy is not causing harm to our land, waterways, bodies or our bees (oh, and they also come in recyclable packaging). Some bees prefer to stick to native Australian flowers, but many will enjoy both native and exotic species, so make sure to include a mixture of both in your garden. There is a wide range of native and cultivated herbs, in a variety of shapes and sizes, to cater for small and large bees, and those with both short and long tongues. Bees love weeds such as dandelions, oxalis, fennel, thistles, clovers and onion weeds.